Barry’s Masters in Business series keeps getting better and better. A few weeks back he spoke with Leon Cooperman, and more recently he interviewed the brilliant Howard Marks. When a Marks memo hits Warren Buffett’s inbox, he reads it immediately. That’s the sort of thinker the founder of Oaktree Capital is. Howard Marks has been in the industry for 47 years and I’m pretty confident that he has learned a lot of the right lessons. So when Barry asked the following question, I was really eager to hear his response. “What’s the most important changes to the financial industry? This is such a great point. The allure of catching the next Microsoft or Amazon is what keeps many people in the stock picking game. One example he brings up is Apple. If you’re an investor or trader, it’s a near certainty that you’ve owned this stock at some point over the last decade. It’s also extremely likely that you no longer own your original purchase (guilty). Since the iPhone first launched in 2007, Apple has compounded at nearly thirty percent a year, turning a $100 investment into $800 today. However, to Marks’ point, it was extremely difficult to stay on the horse. Since 2007, Apple has had single-day declines of at least five percent thirty-four times, and three different days of double digit declines. 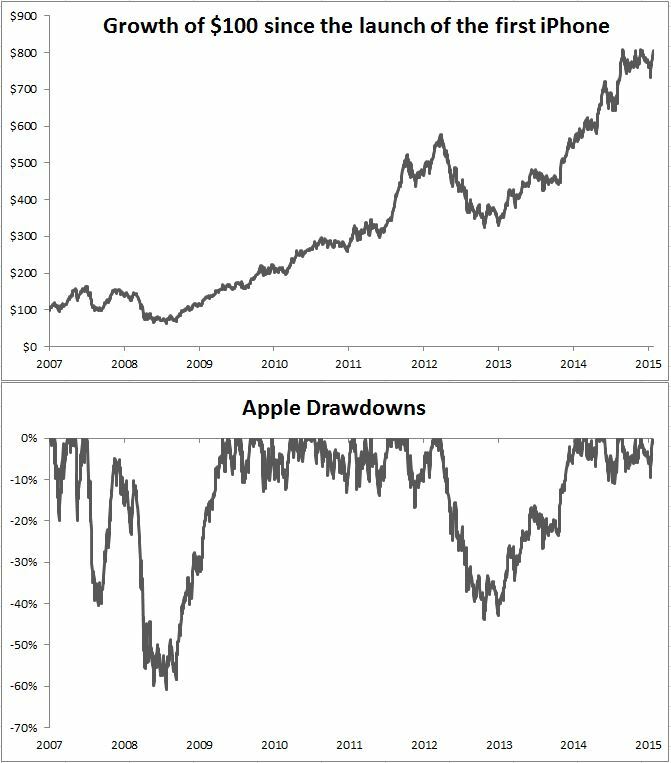 If you were lucky enough to buy Apple in 2007 and hold on until today, you would have been in a 20% drawdown thirty percent of the time! So if you’re looking for the next Apple or the next Tesla or the next Celgene, you must understand that gut wrenching drawdowns are the price of admission.